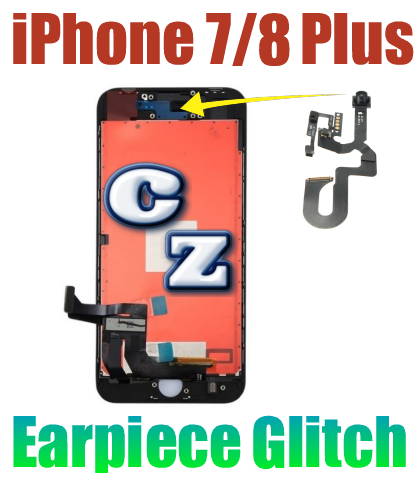 iPhone 7 Plus/8 Plus Earpiece Glitch After Screen Repair - Solved! If you’ve cracked your iPhone 7 Plus or 8 Plus and had the LCD assembly replaced, there’s a fairly good chance you’ve run into this annoying glitch due to a design flaw in these two iPhone models. After removing the flex assembly from the original broken screen and transferring it over to the new LCD assembly, many repair techs have reported stories of the earpiece speaker failing to work. I have run into this myself on at least 1/4th of all the iPhone 7 Plus and 8 Plus repairs that I have done. Apparently, the flex cable is super sensitive and cannot be bent in the slightest manner without causing the earpiece to stop working. But some say that it occurs when you don’t replace the small black piece of insulating tape that sits behind the proximity sensor. Others claim that it’s due to the earpiece itself. But I have found that these two theories aren’t exactly right. When you pluck out the flex assembly to move it to the new frame, you have to be super careful not to damage the cable. But even when exercising extreme caution and applying low heat to soften the adhesive, you can still end up with a dead earpiece once you are done. The flex assembly has the earpiece conductor leads, and also contains the noise canceling microphone, proximity sensor, and the front facing camera. But what is odd is that only the earpiece assembly seems to sustain damage when it is moved. Whatever the case, this boils down to a design flaw. After dealing with this common issue ever since the release of the iPhone 7 Plus, I have not been able to nail down a definitive answer on what is causing the problem. But I have figured out a fail-proof workaround. When you have a 7 Plus or 8 Plus screen repaired, it is best to get a high quality replacement LCD assembly that comes with a new proximity sensor flex cable pre-installed. These cost a little bit more than the plain replacement screens, but having the new earpiece speaker and flex assembly installed from the manufacturer completely eliminates the chances of running into this issue. It’s best to let the manufacturer test the screen and proximity flex assembly to insure all of the components are working, rather than taking the chance on moving that super-fragile cable and ending in complete frustration when your customer can’t use their phone without their ear buds. There is nothing worse. I’m going to keep looking into this issue, and hope to pinpoint the actual reason this problem occurs. Until I figure this out, my recommendation on iPhone 7 Plus and 8 Plus screen replacements is to go with the pre-installed flex assembly & new earpiece. It’s definitely worth the peace of mind! If you’ve got some advice or an opinion of why this glitch is happening, I’d be super grateful if you’d share it in the comments section. As always, thanks for checking out the story, and for supporting the blog!